When one joins the United States Military, one becomes subject to a completely new justice system. While the primary purpose of the United States justice system is to dispense "justice," that is not the primary reason for the creation of a separate justice system for America's Armed Forces. The primary purpose of the Military's system is to provide the military commander with the necessary tools to enforce good order and discipline. That's why, for example, it's not considered a "crime" to be late for work at your civilian job, but it is a "crime" to be late for work in the Military (violation of Article 86 of the Uniform Code of Military Justice, or UCMJ). The military commander has several methods available to enforce good order and discipline within the unit, ranging from mild administrative measures such as formal or informal counseling to full-blown General Court Martials, in which a person can be sentenced to hard labor, or even executed. Part I of this article gives a general background of the United States Military Justice System. A counseling can be formal or informal. It can also be verbal, or it can be in writing. It can be positive (pat on the back) or it can be corrective. A reprimand or an admonition is a "chewing out." They can be verbal, or they can be written. Written reprimands and admonitions can provide a "track record," which could later be used to justify punishment under Article 15, or administrative demotions & discharges. Extra Training is not the same as "extra duties" imposed under Article 15. Extra duties are "punishment," extra training is not. To be legal, "extra training" must logically relate to the deficiency to be corrected. Administrative discharges are authorized for a variety of reasons. The characterization for an administrative discharge can be Honorable, General (Under Honorable Conditions), and Other Than Honorable. Also known as "nonjudicial punishment," or "Mast" (In the Navy/Coast Guard, and Marines). It is sort of a "mini-court martial" with the commander acting as judge and jury. It's used for relatively minor (misdemeanor) crimes under the UCMJ. The punishment authorized is limited by the rank of the commander and the rank of the accused. In most cases, a person can refuse Article 15 punishment, and demand a trial by court-martial instead. Civilians are protected from involuntary self-incrimination by the 5th amendment. Military personnel is also protected, via Article 31 of the UCMJ. The military has no "bail" system. But, there are special rules which must be followed if a military member is confined prior to court-martial. Article 32 Pretrial Investigations are the military's version of Grand Jury hearings. These are the "biggies." There are three types of court martials: Summary, Special, and General. A conviction by a Special or General Court may be a "felony conviction." Court Martials can award fines, reductions, "punitive discharges," and prison time (at hard labor). General Court Martials can even impose the death sentence for certain offenses. The UCMJ provides a method for military members to file a complaint if they are "wronged" by their commanding officer. This is one of the most powerful, yet under-used tools in the military justice system, for members to assert their rights. Military law (military justice) is the branch of the law that regulates a government's military establishment. It is entirely penal or disciplinary in nature and, in the United States, includes and is analogous to civilian criminal law. Its sources are many and varied, some considerably antedating the United States and its Constitution. However, since it is through the Constitution that our Public Law began to exist, the Constitution can properly be considered the primary source of the law governing our military establishments. Along with the Constitution, there are other sources, both written and unwritten, that govern the military as well: International law contributed the law of war and numerous treaties affecting the military establishment; Congress contributed the Uniform Code of Military Justice (UCMJ) and other statutes; Executive orders, including the Manual for Courts-Martial (MCM), service regulations; usages and customs of the Armed Forces and of war; and, finally, the court system has contributed its day-to-day decisions to clarify the gray areas. All of these make up our military law. The constitutional source of military law stems from two provisions: those vesting certain powers in the legislative branch and those granting certain authority to the executive branch. Also, the fifth amendment recognizes that offenses in the Armed Forces will be dealt with in accordance with military law. in general, make all laws which shall be necessary and proper for carrying into execution the foregoing powers and all other powers vested by the Constitution in the government of the United States or any department or officer thereof. Under the Constitution, the President serves as Commander in Chief of the Armed Forces of the United States, and, when called to Federal service, the President also serves as Commander in Chief of various state militias. The Constitution also empowers the President, with the concurrence of the Senate, to appoint the officers of the services. The President commissions all officers and has the duty to see that the laws of this country are faithfully served. In the fifth amendment, the framers of the Constitution recognized that cases arising in the military services would be handled differently from cases arising in civilian life. The fifth amendment provides, in part, that "no person shall be held to answer for a capital, or otherwise infamous crime, unless on a presentment or indictment of a Grand Jury, except in cases arising in the land or naval forces, or in the Militia, when in actual service in time of War or public danger." The law of armed conflict is the branch of international law that prescribes the rights and obligations of combatants, noncombatants, belligerents, and prisoners. It consists of those principles and usages that, in time of war, define the status and relations not only with enemies but also of persons subject to military control. The UCMJ is contained in Chapter 47, Title 10, United States Code, Sections 801 through 940. Although the authority to make rules and regulations for the Armed Forces is in the Constitution, military law is centuries old. The articles of the UCMJ define the offenses that violate the military law in the Armed Forces of the United States and expose a military member to punishment if found guilty by a proper tribunal. They also set forth the broad procedural requirements implemented by the President's Executive order (the Manual for Courts-Martial [MCM]). For the member, this code is as much a law of the land as a state, or Federal criminal code is for a civilian. By virtue of his powers as Commander in Chief, the President has the power to promulgate Executive orders and service regulations to govern the Armed Forces as long as they do not conflict with any basic constitutional or statutory provisions. Article 36, UCMJ, specifically authorizes the President to prescribe the procedures (including rules of evidence) to be followed before the various military tribunals. Pursuant to these executive powers, the President has established the MCM to implement the UCMJ. The President and Congress have authorized the Service secretaries and military commanders to implement various provisions of the UCMJ and the MCM and to promulgate orders and regulations. Our courts have consistently held that military regulations have the force and effect of the law if they are consistent with the Constitution or statutes. Regulations and orders issued at lower levels of command are enforceable by Article 92, UCMJ, which prescribes violations of general orders and regulations, and Articles 90, and 91, UCMJ, which prohibit disobedience of the commands of superiors. Military justice is as old as the earliest organized forces. An adequate and fair system of military justice has always been essential to the maintenance of discipline and morale in any military command. Thus, the evolution of military justice has necessarily involved the balancing of two basic interests: warfighting and the desire for an efficient, but fair, system for maintaining good order and discipline. The desire for uniformity amongst the services resulted in the enactment of the UCMJ, effective 31 May 1951. It was implemented by the Manual for Courts-Martial, 1951. The UCMJ established service courts of military review, composed of appellate military judges, who were, and are, the first level of appeal in the military justice system. The UCMJ also established the US Court of Military Appeals (now known as the US Court of Appeals for the Armed Forces (CAAF), originally composed of three civilian judges, which is the highest level of appellate review within the military system. (The Court added two more civilian judges on 1 December 1991.) The creation of this appellate court structure was perhaps the most revolutionary change in military justice in our country's history. In this structure providing for appeal and review of courts-martial convictions, the checks and balances of civilian control of the Armed Forces were carried over into the military justice system itself. After several years of preparation, a new MCM became effective on 1 January 1969. The primary purpose of the revision was to incorporate changes made necessary by the decisions of the US Court of Military Appeals. Less than a month after the President signed the Executive order promulgating the new 1969 MCM; Congress passed the Military Justice Act of 1968, the major portion of which became effective 1 August 1969. Among the substantive changes made by the Military Justice Act of 1968 was the establishment of a trial judiciary, which consists of "circuit-riding" judges in each service. The act also allowed an accused the option of being tried by a military judge alone (no court members) if the member so requested in writing and if the military judge approved the request. Effective 1 August 1984, the Military Justice Act of 1983 made several procedural changes, including provisions for government appeals of some rulings by military judges. The government may not, however, appeal findings of not guilty. The act also provides for both defense and government appeals to the US Supreme Court from the US Court of Appeals for the Armed Forces. The UCMJ today reflects centuries of experience in criminal law and military justice. The military justice system has evolved from one that permitted commanders to impose and carry out the death penalty to a system of justice that guarantees service members rights and privileges similar to and in some cases greater than, those enjoyed by their civilian counterparts. Personal jurisdiction; that is, is the accused a person subject to the UCMJ? Subject-matter jurisdiction; that is, is the conduct prescribed by the UCMJ? If the answers are "yes" in both instances, then, and only then, does a courts-martial panel have jurisdiction to decide the case. Members of a Reserve component while on inactive-duty training; but, in the case of members of the US Army National Guard and US Air National Guard, only when in Federal service. Retired members of a Regular component of the Armed Forces entitled to pay. Since the enactment of the UCMJ, the Supreme Court has held that the military cannot constitutionally exercise jurisdiction over civilian dependents of members of the Armed Forces. 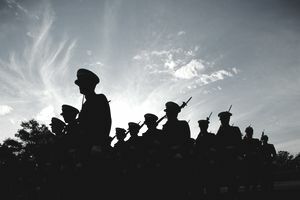 Additionally, the US Court of Appeals for the Armed Forces has held that the military lacked jurisdiction over civilian employees of the Armed Forces during the Vietnam Conflict, even though the alleged crimes were committed within the combat zone. The court held that the phrase "in time of war" contained in Article 2(10), UCMJ, means a war formally declared by Congress.